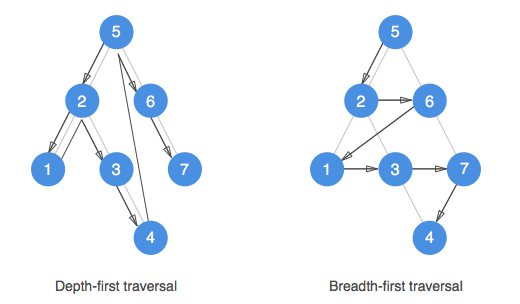 Depth-first search (DFS) and Breadth-first search (BFS) are algorithms for traversing or searching tree or graph data structures. While both starts at the root, DFS explores as far as possible along each branch before backtracking while BFS explores the neighbor nodes first, before moving to the next level neighbors. What is happening here is that every time we get out of the container a node that we stored in there earlier, we unwrap its children and store each of them back into the container, moving on unitl we don’t have any more nodes in it. All the logic is therefore delegated to the <container>, and how the container <store> and retrive the <next> element (that in our case will be a tree node). In the case of a DFS where we want to explore as far as possible along each branch before backtracking, a stack will be the perfect candidate for implementing our <container>. Thanks to its LIFO (Last-In-First-Out) approach, every time we’ll pop the <next> element it will be a direct a child of the branch we are traversing, or in the case we reached the end of a branch, a backtracked node up in the branch, where the branch forked out. As soon as we encounter a node that allow us to explore deeper we’ll move into that branch and explore it till we reach its end, before strarting to backtrack again. And so on until we traversed the whole tree. In the case of a BFS where we want to explore the neighbor nodes first, before moving to a depper level of the tree, a queue will be the perfect candidate for implementing our <container>. Thanks to its FIFO (First-In-First-Out) approach, every time we’ll dequeue the <next> element it will be a neighbour node, or, in the case we visited all of the neighbours for that specific depth of the tree, the first node in the next level.And so on until we traversed the whole tree. I found mastering DFS and BFS algorithms to be very beneficial for solving many tree traversing problems.